Hands down, dressing/stuffing or whatever you want to call is by far the most favorite Thanksgiving side dish...yes, even favored over mashed potatoes. You don't see someone standing in the kitchen at 8:00am the day after Thanksgiving eating cold mashed potatoes for breakfast, nope they're scarfing down cold leftover dressing (if there's any leftover) and loving every bite of it. I guess it's America's love affair with anything and everything made of bread. There couldn't be a simpler dish to serve to make people happy on Thanksgiving and there are so many different ingredient combinations to choose from. This is a rustic, peasant dish and you can add whatever you like and it will still taste fantastic. If you don't like chestnuts, then add walnuts or pecans. If you don't like dried cranberries, then add currants or golden raisins. And if you you don't like apples, then add pears, or a combination of all of the above. There is no right or wrong--there is no recipe. The only thing you need to keep in mind when making dressing/stuffing is the flavor and texture of the croutons you will be using because this will determine how much seasoning you need to add, and the amount of veg stock that you will be using. 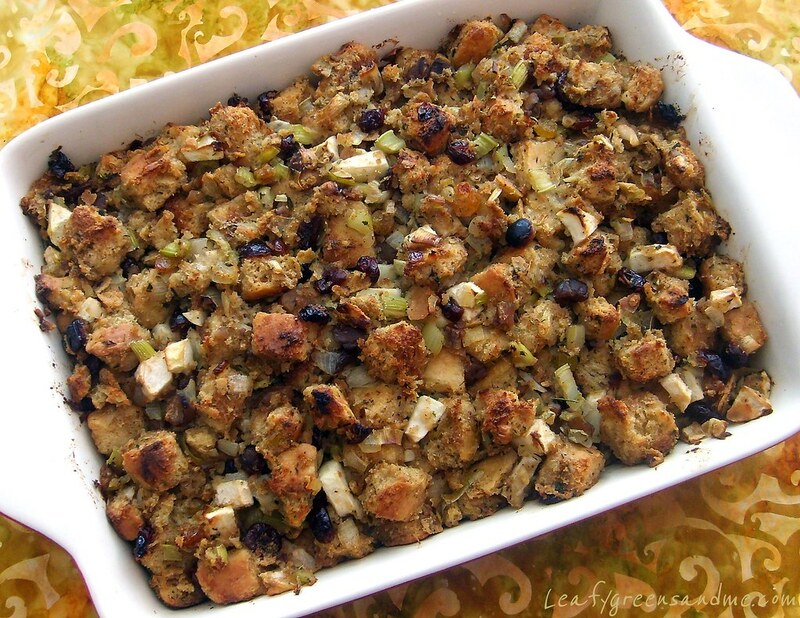 Even though it's just baked bread you want it to be flavorful and you want it to have the right consistency--nothing could be worse than eating a boring, dry or gummy dressing/stuffing, especially on a special occasion like Thanksgiving. Note: I baked off two separate focaccia recipes and cut the bread into 1" cubes. I placed the cubes on two sheet trays and let them sit out for about 15 hours or overnight. I preheated my oven to 200 degrees and I baked the cubes for 1 hour until they were dried out and crunchy. I let them cool and then measured out 12 cups of croutons for my dressing, and froze the remaining so that I can use in soups or salads. If you don't have time to make your own focaccia, purchase a couple of loaves of fresh focaccia (depending on the size) and cut into cubes, or to make it really simple just purchase your favorite pre-made bread cubes. Just make sure that they're vegan and don't contain a lot of additives. In a small sauce pan, heat vegetable stock just to a simmer and whisk in vegan chicken flavored seasoning. Remove from heat and set aside. Add focaccia croutons to a large bowl and set aside. Heat a large saute pan on medium-low and add olive oil, leeks, onions, celery, garlic, thyme, sage, rosemary, poultry seasoning, and salt and pepper to taste and saute for about 7-10 minutes until soft. Add diced apples and cook about 3 minutes longer. Turn off heat and let cool to room temperature. Add leek-onion-celery mixture to croutons, along with cranberries and chopped chestnuts and stir well to combine. Add two cups of vegetable stock and stir well. Let sit for a minute or so before adding another 1 cup of stock and stir well. Repeat adding about 1/2 cup of stock at a time until the croutons are soft, but still hold their shape. You want them to be moist, but not mushy or dry. Because my croutons are made with whole wheat, they are denser and I used the entire 4-1/2 cups veg stock. If you purchase store-bought croutons or use white bread you may use less veg stock. Check for seasonings and add salt and pepper to taste if needed. Butter a 12x9 or similar size casserole dish with Earth Balance and spoon dressing into dish and distributing evenly. Cover with foil and bake in the oven for 20 minutes. Remove the foil, rotate the dish and bake another 20-25 minutes until golden brown.